On Saturday 14th May 2015 at 7:30pm Burgess Hill Symphony Orchestra will present their Spring Concert at St. Andrew’s Church, Junction Road, Burgess Hill. 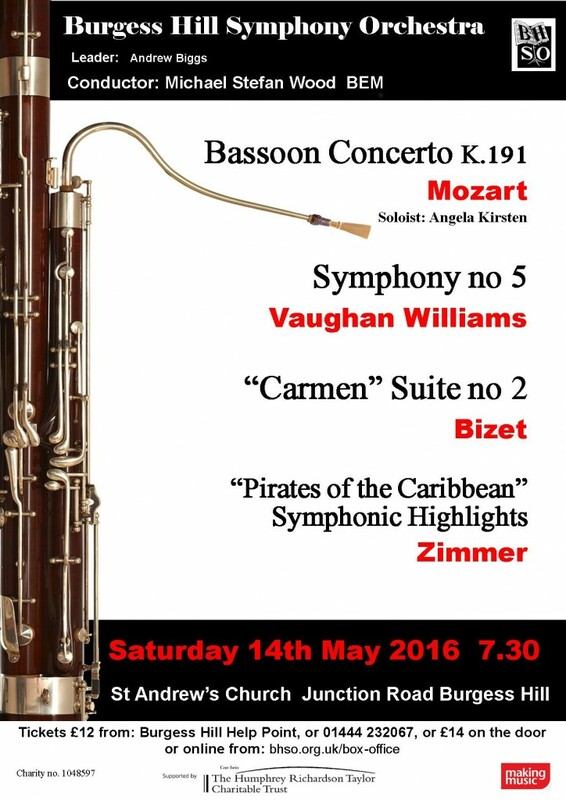 Led by Mike Wood, you will be treated to what promises to be a stunning performance of Mozart’s Concerto for Bassoon played by our very own Angela Kirsten, who has been a key member of the orchestra’s woodwind section for many years. Angela Kirsten teaches bassoon at West Sussex Music. If you are thinking of taking up a woodwind instrument, especially the bassoon, please do come along and experience what a beautiful instrument the bassoon is. Amazingly Mozart was only 18 years old when he composed this concerto. The Carmen Suites are two suites of orchestral music drawn from the music of Georges Bizet’s 1875 opera Carmen. The orchestra will be performing the second suite which includes the famous Habanera and Chanson du Toréador. After the romantic tranquility of the Vaughan Williams Symphony No.5 we round up the evening with a trip to the movies. Those who have enjoyed the Pirates of the Caribbean films are in for a treat! Tickets are £14 on the door or £12 for tickets purchased in advance. Accompanied under 16’s free (ticket required). Purchase from the Burgess Hill Help Point, or call 01444 232067, or buy your ticket online at http://www.bhso.org.uk/box-office/. We would particularly like to thank the Vaughan Williams Charitable Trust for financial support.